Bird on your line? Don’t cut it! The other morning while birding at Gemini Springs, I shared the dock with a woman who was fishing at the end. I was about finished scanning for birds when I heard her struggling. She had caught a Double-crested Cormorant on her line and she was trying to reel it in. So often I find discarded fishing line and trash dumped on the pier, and junk left behind by fishermen stands in the spring run and bayou at the park. Unfortunately this reflects badly on all fisherfolk and I have a very bad impression of fishing enthusiasts that I find it hard to get over. The fact that this woman did not simply cut her line, which I believe most fishermen in her position would do, made my day. I rushed over to help her reel in the bird. I grabbed her net when the bird was close and managed to get the net under the struggling cormorant. Naturally the bird had no idea we were trying to help it so it put up a fight. The fisherwoman and I lifted the bird up and then we worked together to control the bird’s beak. Besides being deadly-stabby, Double-crested Cormorant bills have the added bonus of a hooked tip. If it gets your finger, its more difficult to extricate said finger from the grabby/crushy grasp. We both took care to keep our faces away from the stabbing bird. 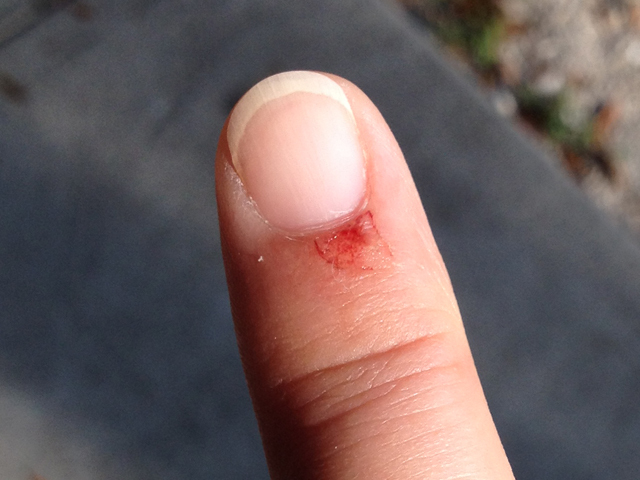 My partner had a pair of needle-nosed pliers handy, and she used those to gently grasp the bill — but not before my right index finger got scraped good. The pliers proved very handy and eventually I was finally able to control the cormorant’s bill and body while the fisherwoman removed two hooks from the bird. One was stuck in a wing and the other in the flesh of a foot. I don’t know if the hooks were barbed like the ones in this tutorial, but I do know they were removed very quickly in the hands of the fisherwoman. 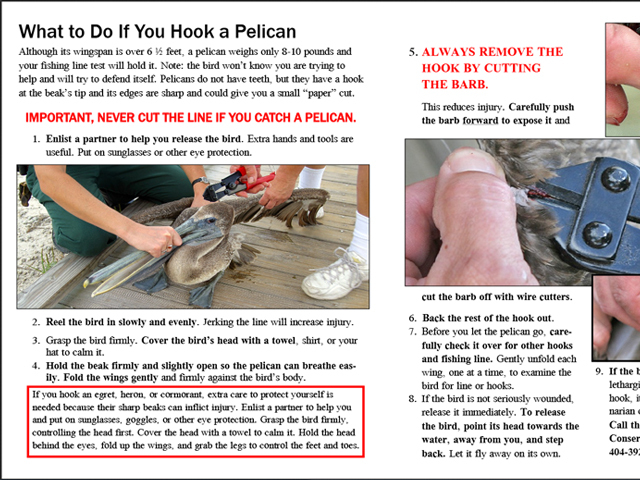 This tutorial was created with coastal fisherfolk and Brown Pelicans in mind, but the idea for any bird/situation is about the same. After the hooks were removed, we released the bird. During the entire ordeal, the fisherwoman was obviously distraught. As we struggled, she repeated over and over that she did not see the bird in the water. She didn’t realize the bird was diving under the water where she was fishing. All I could do was thank her profusely for doing the right thing and not cutting her line. Doing so would have left the bird with hooks in its body and the added danger of entanglement from any attached line. It was an unfortunate incident made right and it gave me a brighter impression of fishers. 2 Responses to Bird on your line? Don’t cut it! This is some great advice and it’s going to save a lot of lives. Any suggestions for capturing a struggling bird in the first place? Should we put something over its eyes to calm it? I live near a big river (PA’s Susquehanna River) and often see discarded fishing lines all over the shore and even stuck in the trees! The tree-bound line gets up there during flooding I suppose. It depends a lot on the bird and the circumstances. A net is always helpful; I carry one in my car always, just in case. I think it is standard equipment for fishing? Placing a shirt or cloth over the birds eyes may help to calm it, yes. I always thought the lines I see stuck in trees comes from wayward casting in the first place. Thanks for your comment.